I learned many things at this college. I learned all of the educational jargon that I was going to need. I was taught about reverse design and the socio-political issues surrounding education policy in the United States. I learned an immense canon of literature which it was a pleasure to sift and gnaw my way through. I learned how to finance an education and how to survive on my own. In total, I became a culturally sensitive, rigorous individual with the technical know-how to conquer the teaching world. And we were different from other graduates around the country, our Dean even stated at our graduation, "We are branding you." I entered the working world with a bizarre confidence in the "tools" infused within me. There was something they couldn't teach me with bills, projects, student teaching or lectures, however. The Golden Circle of self. The dream within the "how" and "what". The fallacy beneath all of my higher education was that I was doing it for "them", for the "kids", not just for myself and, in the grand dance of life, there is something inherently missing from that equation. My pedagogy teacher was confident she had given us all the tools we needed to become great teachers armed for impact. What she didn't know was that she couldn't possibly have that power, just as I cannot claim to have it either. I should mention that this is the same teacher who gave me a C- on a very fun sample lesson I gave to my class because I did not link my instruction to one the chapters she had assigned us to read. School cannot teach you "why", the "why" is personal, it is sacred. What is truly great about a "why" is that, like your heart or brain or lungs, we all have one. We all have beating, thinking, and breathing organs within us driving the rest of our bodies to fulfill the most necessary functions and maintain our lives. A "why" does this as well. And it is very similar to the heart or lungs in that the function becomes lost, becomes involuntary - it pitters away from our consciousness. The heart continues to beat although we don't continually thinking of it. Our thoughts drift from "why" to "how", then "how" to "what" just as blood flows from the heart to cells and produces action. Our drive to live expresses itself in the rhythmic beating of our hearts and expansions of our lungs, not the 6 miles we promised ourselves to run (I'm going, I swear, just gotta stretch). What if our unconscious functions all centered on this "how" or "what" instead of maintaining a strong beating heart? We would drop dead. The human essence cannot give energy to a "how" or "what" - only the "why". A strong flow of oxygen rich blood promotes a stronger action, it gives the energy which makes movement possible. The "why" makes everything else possible and the astounding thing is that it can be contagious. Remaining firmly centered on a "why" centers those around you as well (or infuriates them :) which can be equally educational). In education and much of life, the "what" holds the reigns. My teacher gave me a C- because she looked only at the "what" and the "how" of my sample lesson. "What did he do?" "How did he implement this? ", she forgot that learning, that teaching is actually fun. 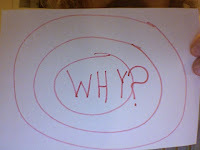 The further away we get from the "why", the smaller the "why" gets and the larger the "what" gets. I didn't quit smoking until I had a "why", I had tried all the "whats" already. It sits there, a beautiful piece of machinery. In your freezer, there waits a frozen mango and a pint of ice cream and they can become the most wonderful smoothie which has ever passed your lips. Let's break this down a bit. The "what" is the smoothie - delicious and creamy, nutritious and satisfying. The "how" is the blender itself. But what is the "why"? Is it the electric socket? Is it the power company which produces the power delivered to that socket? The "why" is you. You will do anything and everything to taste that sweet, creamy smoothie. If the power goes out, you will still have that smoothie. You will get a spoon or a rock and chop that mango up and mash it all into a smoothie and you will have achieved your "what". The "why" is your desire, your hunger for that smoothie. You don't need the smoothie. You could eat crackers. You want that smoothie and it is that want which becomes desire and creates it. The blender is powered by more than amps - it is powered by your desire. Stay true to your desire and you will get that smoothie. A teacher helps students make that smoothie. A teacher keeps the student in touch with the "why" so that that smoothie gets made. We teachers have a tendency to ask for a taste of our students' smoothies, but they don't want to share. Well, fair enough. Can you start with a "what" - sure. chances are, however that that "what" is there because your "why" is unconsciously beating. My "why"? - I'm not telling, but I think you can guess. My "what" - a fun, rigorous classroom that challenges every person who steps foot in my door. In reality, though, I can do none of this, it is an individual meditation for each of my students. The further away from the "why" we get, the smaller and more disconnected it becomes - the further away from bliss and success we go. Focus on the "what" and the "how" in education becomes indoctrination. And indoctrination is not cool. When we focus on the "what" (test scores), the "why" becomes an ignored post it which eventually falls and is lost under the fridge. His "why" is so good that he doesn't even have to spell it right. That's what we've got to remember, the "why" is so sweet. I must give due intellectual credit to the TED speaker, Simon for his work on the concept of the Golden Circle. He applies the concept mainly to innovative companies like Apple and I took this concept and made it an educational philosophy of sorts. Click on his name to view his TED talk in its entirety. LINK TO YOUR NEW URL DAWG.